Where the Heck Do I Put This Comma? I know I’ve been harping on about grammar and punctuation a lot lately, but I am of the school of thought that if you are from an English-speaking country, you should have a firm grasp of the English language and usage. It is a sad commentary on society that many foreigners go to great pains to learn English, and accents or no, they grasp the ins and outs of our language better than a great number of us. Granted, English (being the mess that it is) is one of the most difficult languages to learn, but that’s no excuse. I concentrated on the apostrophe last week, and Lynne Truss’s Eats, Shoots & Leaves, but this week I’m also going to let Noah Lukeman, author of A Dash of Style: The Art and Mastery of Punctuation , chime in as well. Eats, Shoots & Leaves is for those of us who are sticklers, the die-hard punctuation freaks who are ready to defend the likes of commas and semicolons to the death. Truss also addresses style with a bit of history and humor thrown in. She has the unique perspective of a British editor, and she points out the differences and similarities between British and American punctuation. Lukeman, an American writer and literary agent, sticks to style; he assumes that we come to the page with the knowledge, and now we need to apply it. As such, I’ll let Truss go first, then allow Lukeman to round out the conversation. And since I gave the apostrophe so much time last time, I thought I’d give the same amount of space to the comma here. Rearrange the commas and add a colon, and you have two completely different ideas. Unlike the apostrophe, however, there is no neat little list of all the rules of comma usage. Although there are some hard and fast rules (as in always placing a comma between city and state: Jacksonville, Florida), many “rules” can be ignored and are merely there to satisfy the desires of some writers and editors. I’m kind of a “the more the merrier” kind of gal, whereas Lynne Truss uses commas less frequently. There is a purpose for commas, though, no matter how tricky that purpose is to define and apply. I identify with Truss’s musical notation explanation because I am a musician as well as a writer. When you consider it that way, it seems so sensible. Why not allow it to do its job and aid the written word? After all, when we talk, we speak with inflection, and most of us don’t run all of our words together. But if you were to read a long sentence (such as this one), full of twists and turns and various types of clauses, without the aid of inner-sentence punctuation, you would find quite a mess. You might have to puzzle over a jumble of words several times before getting the emphasis just right. Commas can help. Yeah, I am a wee bit guilty of letting my commas become unstoppably enthusiastic. You know that pesky Oxford comma? It’s the one in series that goes just before the “and”; it’s the last comma in: “I had an omlet, hashbrowns, and mixed fruit for breakfast.” My parents and I have many unresolved fights about this one. I’m right and they’re wrong. Except that they’re right and I’m wrong because I’m younger, and nothing I read (including Strunk & White) can refute their education. Doesn’t matter that I’m the editor. Well, as it turns out, we’re all right because the Oxford comma is optional. There are cases when it assists the clarity of a sentence. You could have lemonade, chicken fingers and macaroni and cheese (without the Oxford comma), or you could have lemonade, chicken fingers, and macaroni and cheese (with). Since “macaroni and cheese” is considered one item in that series, the comma helps tell the reader where the series will end. Okay, enough about that. You’re either going to be with me or against me (or likely not care at all). There is one rule that Truss spells out quite clearly, and with which I hope we can all agree. And if you don’t get it. . . well, then you’re on your own, I’m afraid. “The big final rule for the comma is one that you won’t find in any books by grammarians. It is quite easy to remember, however. The rule is: don’t use commas like a stupid person. I mean it” (96). Yes, ma’am. She gives several examples, and my favorite is, “Leonora walked on her head, a little higher than usual.” If you ever see me write something like that, know that I’ve been abducted, and some doppelganger imposter has taken over. So once you’ve figured out where to place that little bugger, Lukeman is the guy sitting in the plush chair with the notepad, watching you with one eyebrow raised, ready to help you discover what your comma placement means. While Truss likens punctuation to musical notations and commas to sheep dogs, Lukeman borrows a quote from journalist Russell Baker that I like just as much. “In writing, punctuation plays the role of body language. It helps readers hear you the way you want to be heard,” Baker says (28). 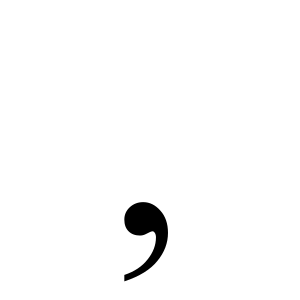 A proliferation of commas or a complete lack of them not only guides the reader in hearing pauses (or not) in a phrase, but it shows something about the author, as well. Knowing that I have a little problem with overindulging in commas, I was a bit anxious when I got to the part about what that means. I suppose it’s a bit like a literary horoscope. Gulp. Okay, I suppose I am guilty yet again, although ever since taking multiple fiction workshops with my good friend Mark Ari many years ago, I’ve gotten much better about tightening my prose and losing adjectives and especially adverbs. I guess the commas are leftover scars, and I’m doing my best to remedy their use, while maintaining my own style. But never fear, Lukeman also addresses those who don’t like commas. Phew! Thank goodness that’s not me. Actually, I know I am also guilty of info dumping, especially in my early writing days. It’s something that I think many beginning writers fight – or don’t fight, if they lack proper instruction and criticism – and I see it all the time. This, I think, is where it’s handy to remember the image of the comma as the helpful sheep dog. So if you scrutinize your comma usage, where do you fall? Are you scared that you don’t get your point across, using too many descriptions? Or do you just let it all flow and let the reader fend for himself? As with everything, I think a little moderation is in order here. Let the reader use his imagination a little, but don’t forget to leave a few cues along the way. This entry was posted in Book Reviews, Writing and tagged A Dash of Style, Comma, Eats Shoots & Leaves, Grammar, Lynne Truss, Noah Lukeman, Oxford Comma, Punctuation, Writing. Nice post; and it’s definitely a tricky subject. I tend to go in with loads of commas to start with, and then pluck them out on the second read through, tightening the sentences as much as I can without detracting from its meaning. I also think that a lot of people need the breathing space that a full-stop affords. That’s it. Rest. Take stock of what you’ve read. Start again. Cheers for the good read. That’s why I never go with my first draft. Thanks, Rob! Great artical! I am definately comma afflicted. Never quite sure if I’m using too many or too few. I agree that it is better to err with too few.